Through the numerous conferences and activities it has held since its establishment, experts and scholars from Taiwan, Japan, Korea, Singapore, Philippine, Mainland China, Hong Kong and Malaysia have contributed in formulating the Asian-Pacific perspective of WTO and health affairs through their active participation via research articles and insightful feedback. 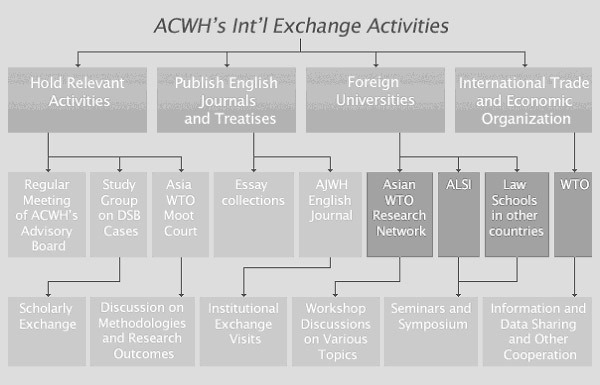 Pre-eminent authoritative figures on WTO and International Health Law assisted the ACWH by joining the Editorial Committee, and by presenting speeches on relevant issues. This international network is indispensible in the full operation of the ACWH in carrying out its missions.